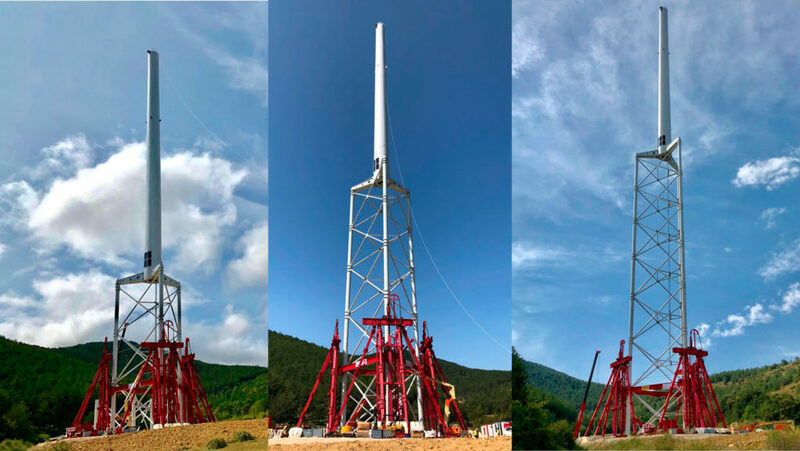 Nabrawind Technologies has completed the installation of the world’s tallest onshore steel wind turbine tower in Eslava, Northern Spain. Standing at 160m tall, the Nabralift full-scale prototype was installed in under two weeks. The tower’s unique design means it can be installed, together with the turbine nacelle and rotor, via a patented self-erecting system using hydraulic jacks, enabling elevation by adding small frame modules at ground level, eliminating the need for massive cranes. The tower is a 20% lighter than the current steel towers and can be transported in standard trucks. The design of the tower also reduces the foundation size, and the installation process can be executed in small assembly platform, reducing the footprint as well as reducing the civil works cost. The new generation of onshore 3MW-5MW turbines will require very tall towers to accommodate large blades and reach competitive wind speeds in the mainstream low-wind sites . This larger rotor diameter means that the turbine can generate more electricity, more efficiently – resulting in less turbines needed to reach desired generation capacity. However, current tall-tower technologies face design, logistic and installation challenges that are restraining the growth of this type of products. The prototype will be tested after installation to demonstrate 25 years of operating life through fatigue load tests. Once complete, Nabrawind Technologies is set to install up to seven more towers in 2019, ranging up to 200m in height.